Here is the seventh clue of the day. It's not necessarily the right clue for today's question, but it will be useful eventually. Here is the sixth clue of the day. It's not necessarily the right clue for today's question, but it will be useful eventually. And maybe it would be worth your while to check the How to Play page again. Though the procedure remains unchanged, a couple of sentences (about brackets) have been added by way of reassurance to competitors who wrote in with questions. Here is the fourth clue of the day. It's not necessarily the right clue for today's question, but it will be useful eventually. Here is the third clue of the day. It's not necessarily the right clue for today's question, but it will be useful eventually. Here is today's clue of the day. It's not necessarily the right clue for today's question, but it will be useful eventually. We're adding a fresh clue daily. It's not necessarily the right clue for today's question, but it will be useful eventually. 'Tusind tak' to DR2 in Denmark for ushering Christmas in with that magnificent excerpt from the forthcoming Procol Ledreborg orchestral DVD. 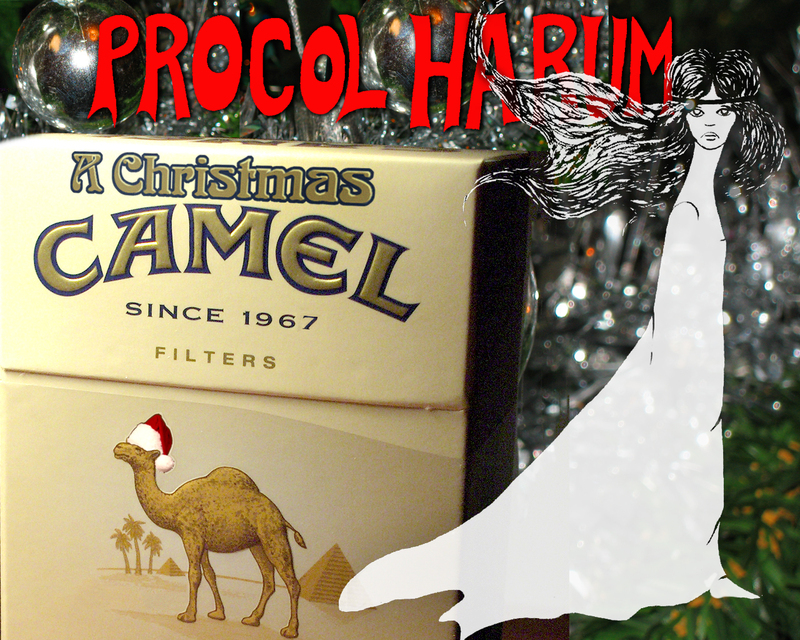 And bravo Procol Harum! Missing tracks (to fit in the sixty-minute slot) were Butterfly Boys, The VIP Room, Simple Sister, An Old English Dream and Whaling Stories. Credits at the end included Keith Reid (texts) and Chris Cooke (project leader). December 24: We wish you all a Merry Christmas! 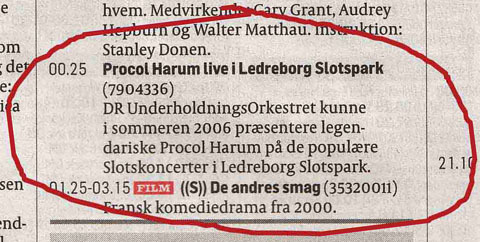 Get ready to watch Procol Harum at Ledreborg Castle on Danish TV: the one-hour edit of the show from 20 August 2006 will be broadcast at 00.25 European Time, early on the morning of Christmas Day, 25 December. It can be viewed on web TV following this link (thanks Mogens). Alternatively use this DR2 link and double-click on the little screen at the top right of the page: the picture will expand to fill your screen (thanks Chris, Pat, Tim, Henrik). Unfortunately it seems the first of these functions for Danish IPs only, but it might be worth giving it a try if the second fails you. If you live in Norway and receive TV signals from Canal Digital, you could follow webmaster Jens and purchase a one-month subscription to Danish TV. This may be possible for subscribers of other satellite companies and in other countries as well. 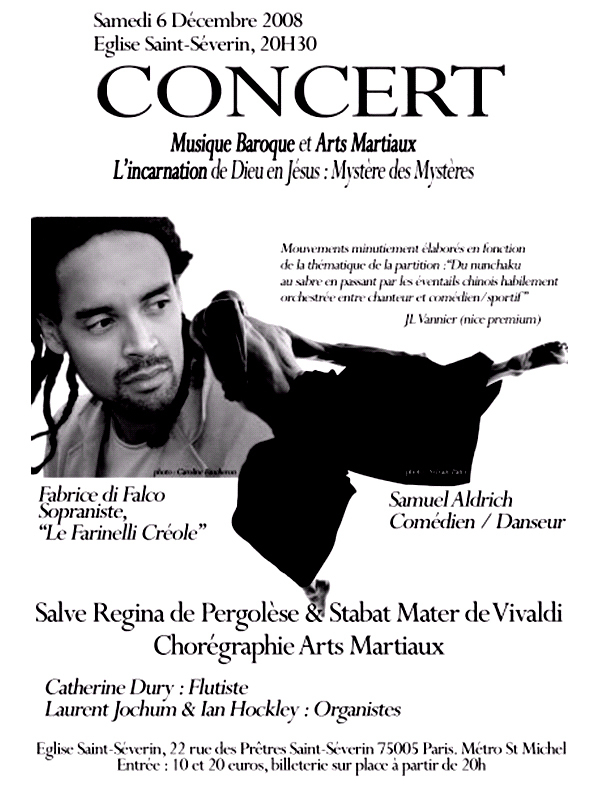 The rest of us will have to wait for the upcoming DVD from the Ledreborg concert, available in 2009. This DVD (which features the full concert) is also one of the prizes (twice) in our annual Christmas puzzles..
And who needs a winged horse, when you can run this short film? Coming soon: the annual BtP puzzles, in which the above DVD will be one of the glittering prizes. When doing your online Christmas shopping for books, music, electronics and so on, please use the Amazon links in the box above. It costs you nothing extra, but each transaction contributes a few cents towards keeping this website online. Added the sleeve for a Procol 45 rpm 'Golden Greats' re-release (thanks, Lars) – anybody able to tell us the date of it? Here's the link to an interesting recent web-chat with best-selling genealogical author Peter Christian, who is well-known to fellow Procol concert-goers. Many thanks to various correspondents who have supplied further Procol dates for the annals. Maybe somebody out there can help with a precise date for Procol Harum's Ravinia Festival appearance in 1970? Thanks for the good response to our questions about the possible further nine 1972 Procol Harum gig dates at the foot of this page: please let us know if you can confirm any more of those conjectural Procol November dates. 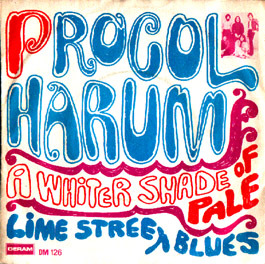 Thanks to some thoughtful sleuthing by a correspondent, we now have a possible further nine 1972 Procol Harum gig dates (thanks, Marvin). If you were in America in 1972, please look at the list at the foot of this page and let us know if you can confirm any of those conjectural Procol November dates. December 7: Sorry for the delayed upload today: server glitches.